Raise your hand if you write or have attempted flash fiction? (*raises hand*) If you have - and actually, even if you haven't - you need to read this book In a Flash by Melanie Faith. First, what I loved the most about this book is I could flip through it, land on a section, and read it and gain something from it, without having to read the entire book all over again. It's the kind of book, like a yummy fruit salad, that you can take something from a bit at a time and enjoy it. One of my favorite sections described how to decide on which POV to use (I obsess over this). In this chapter, much like in all the other chapters, it gave me questions to ask myself about the piece I was working on. Questions like "How important is immediacy" made me really think about the purpose of the point of view I was choosing in a story. Best of all, this section ended with a writing prompt, which was my favorite part about this book. The prompts after each section were so important to me and the one thing that I valued the most in this book. • Let go of the need to know how this draft will end. Yes, some authors already know the ending before they start (and it’s perfectly fine if you do), but many of us don’t. If you’re writing, the ending will come—even if you write past it or around it, you’ll feel it as you draw near. Trust. Oh how powerful was that for me to read. I need that in bold font in front of each writing session. I obsess over the need to know how things end in a story. Best of all this book also goes over ways to write for both nonfiction and fiction. While I'm not a non fiction writer, I greatly benefited off these section as well. This is a must have, even if you don't write flash fiction. It still gives you a lot to think about and it really helped me examine my writing in such a specific, unique way. 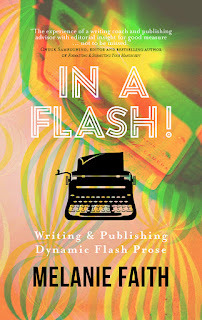 Be sure to check this out on Amazon and pick up your copy of In a Flash: Writing & Publishing Dynamic Flash Prose. Follow Nicole Pyles on her writing journey by following her Twitter account @BeingTheWriter. I'm going to have to check out this book, Nicole! I love books on writing, especially those, like you mentioned, that you can flip through a find something wonderful without having to read it all from start to finish. Yeah! Those kinds are my favorite for sure. I get something new from it each time I go to this book! Nicole--I like those ADD books too--those books you can read as if you have ADD, flitting around from section to section in an illogical fashion. It sounds like a great book, and flash fiction is all the rage these days... So, thanks for sharing the book. You're going to help Melanie sell a lot of books with this one, Nicole. I love the description of the book and how it looks like we can bounce around and choose what advice we want to focus on. Happy writing!